From Korean dramas, “Gangnam Style” and BTS to the PyeongChang Winter Olympics, Korea has been on the receiving end of tremendous exposure to global audiences in recent years. 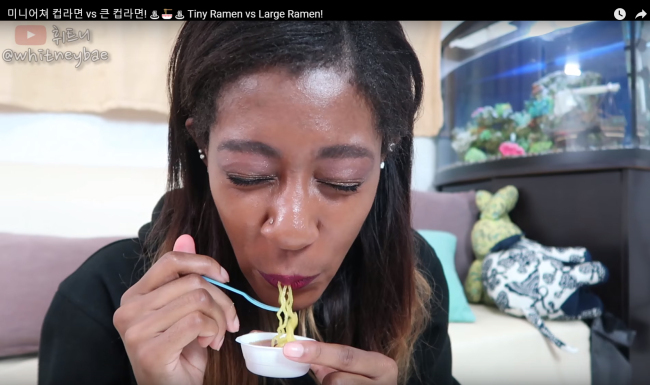 But there are two influencers on YouTube who want to share with foreigners what “real life” -- often less glamorous but more human -- is like in Korea. 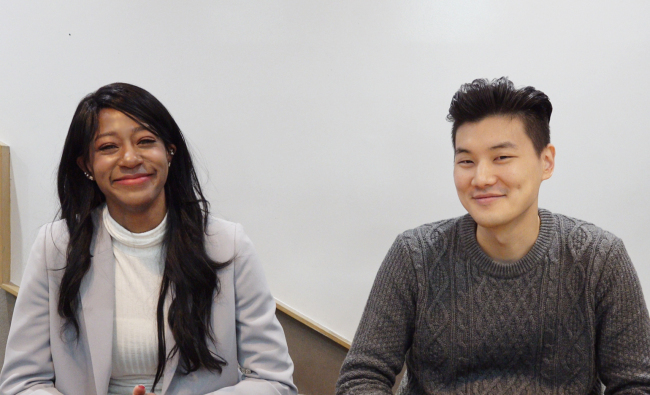 The Korea Herald sat down with Lee Kyu-ho and Whitney on Feb. 7 at Google’s Campus Seoul to discuss their content. It’s a lazy afternoon in Seoul. Husband Lee Kyu-ho is chopping vegetables in the kitchen for a salad. Wife Sarah opens the door to receive a delivery. In the box is a new collar the couple ordered a few days ago for their pet cat Beemo, who is sunbathing by the window. This international couple’s laid-back everyday life has been garnering popularity on YouTube. 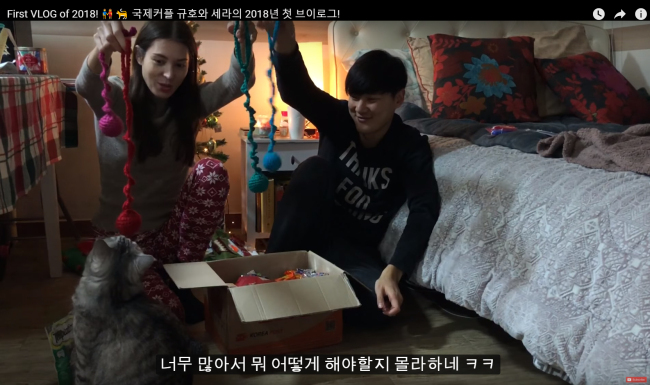 Korean Kyu-ho and Canadian Sarah, who married in 2015, are at once typical and ideal newlyweds. They eat, travel and live out their days together in a companionship that fans say is heartwarming to watch. “I knew you were going to say that,” Sarah often tells Kyu-ho. “I knew you would like that,” he comments after getting her to try something new. Their simple joys are documented on the YouTube channel 2hearts1seoul. The couple’s goal is to share the realities of life in Korea, as well as the normalcy of an international marriage, Kyu-ho says. “There really isn’t a culture barrier between Sarah and me,” said Kyu-ho, who grew up in international schools in Russia and India. But many of 2hearts1seoul’s subscribers and fans have questions about international marriages and families. Nowadays, as more foreigners are visible on Korean television, the Korean public is becoming increasingly more open, Kyu-ho noted. International couples often approach Kyu-ho and Sarah and begin chatting animatedly about the similarities and differences between their lives, he says. In terms of sheer excitement, Whitney just might rank at the top among YouTubers. 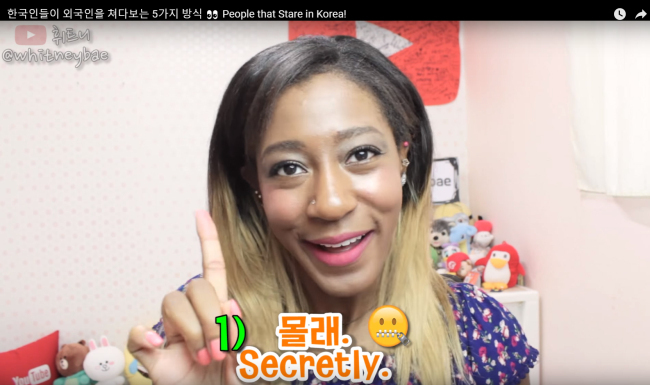 In videos that address everything from Korean beauty regimes to how Koreans stare at foreigners, the American creator laughs loudly, squeals with glee and throws her hands up in the air. When trying Korean convenience store snacks, she uses all of her face to express the taste. Whitney, who started her channel whitneybae four years ago, says she first made Korean friends while in university in the US. They fully welcomed her into their group, teaching her Korean slang and introducing her to a whole different culture. “Wherever you go, Korean kids stick together. But they weren’t a closed-off group, at least in my experience. They were so welcoming. Nobody treated me differently,” she said. Through more and more foreigners are becoming enamored with K-dramas, they often overlook the fact that the shows are fantasized versions of life in Korea, Whitney says. 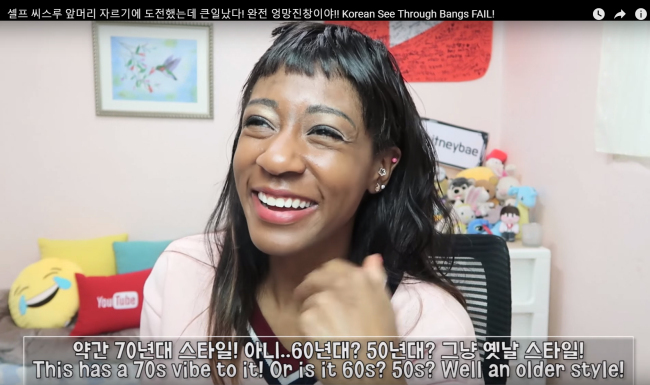 As an African-American woman living in Korea, creating both Korean-language and English-language content for Korean and international viewers, Whitney says she has definitely experienced ambiguities in identity. Even so, Whitney wants to stay here and continue creating content. The warm responses of her subscribers keep her going, she says. Ahn Sang-yool (koolsangon@heraldcorp.com) contributed to reporting.